Do you ever think about how much money you waste on a daily, weekly, or monthly basis? Whether you are strapped for cash or not, you should always be mindful of your spending to ensure you’re not losing money that could otherwise be put to much better use. Overspending is not a good habit to get into because it often means you’ll have less money later to do what you want or need to do. If you think you might be overspending each month, check to see how these expenses may be affecting your budget regularly and how you can save in these areas. I have a love-hate relationship with monthly subscriptions. On one hand, they can seem like they’re very convenient and exciting to use. Who doesn’t love getting cool things in the mail each month? On the other hand, they can seem like a complete waste of money especially if you’re not using the product(s). Plus, I’m noticing that subscriptions are getting more and more expensive these days. The ones that are only a few dollars are sneaky because they can add up over time. I’d recommend carefully looking through your subscription expenses and eliminating anything you don’t use or that doesn’t justify the price you’re paying monthly. Also, consider if you can DIY and get certain items and services yourself without having to pay for a subscription. To do this automatically, sign up for Trim Financial Manager. Trim can help you analyze all of your monthly subscriptions in less than a minute so you can easily see where you’re wasting money. While there’s nothing wrong with using subscription services, the key is to make sure the ones you keep are valuable and being used well so you’re not wasting your hard-earned money. Many banks charge fees, but some are more generous than others. If you bank charges multiple sneaky fees each month, odds are, you’re probably overspending on unnecessary bank fees that could be avoided. While some fees can be avoided like overdraft fees, you shouldn’t have to pay fees if you don’t maintain a minimum balance or if you don’t set up direct deposit. ATM fees can also add up as well when you need cash fast but can’t find an in-network ATM. The solution to these issues is simple – get another bank. Online banks are great because they hardly have any fees and you can bank more conveniently vs. having to go into a local branch whenever you need to deposit or withdraw money. If you are a fan of local banks, make sure you compare your options and take their fees into consideration. Cable is another expense you’re probably overspending on if you still have it. Nowadays, most people have switched to television streaming services like Netflix, Hulu, and Amazon Prime with good reason. Cable can get expensive especially if you pay for extra packages like movies and sports channels. What worse is that if you aren’t actually using those channels regularly, you’re wasting your money. I like streaming services because you can pick what you want to watch vs. having to settle for whatever is on T.V. at the time. Plus, back when I had cable, I never watched all the channels I paid for. You’d basically have to watch T.V. for most of the day to get full use out of your cable package and most people don’t have time for that. Instead, consider trying out a television streaming service to see how you like it and to save money. Or try installing an antenna, like this one, to pick up local channels for free. Your cell phone is another expense you could be overspending on. With the average contract cell phone bill ranging from $120/month to $140/month, there are always much cheaper options where you can get almost the save level of service. Prepaid cell phone companies have been on the rise in recent years, and I’d say it’s the better option since prepaid services have greatly improved. I personally haven’t used a contract cell phone company since high school. I use Straight Talk now and don’t pay more than $50 for my phone bill that provides unlimited talk, text, and a few gigs of data for my apps. With prepaid companies though, I will caution that you still need to compare and shop around to ensure you’re getting the most bang for your buck. It’s not uncommon that some companies charge just as much as they could for a contract cell phone plan. Often times it depends on how much data you need and that can raise the price of your bill significantly. So again, do your due diligence and research before simply assuming that prepaid options will always be cheaper. This is a big one. If you like to use credit cards, you must watch out for interest charges if you don’t pay your bill in full and on-time. If you make late payments, you’ll be charged a late fee as well. Credit cards are nice to use because they allow you to pay for things you want. And you can earn rewards. However, you must make sure you’re not paying interest and extra fees. If so, that will mean you’re spending way more money on the items you bought than necessary. If you’re having trouble controlling your use of credit cards, try to temporarily stop using them or at least reduce how often you use them to make purchases. Set reminders to pay your bill on time and only charge what you can afford to pay back at the end of the month. 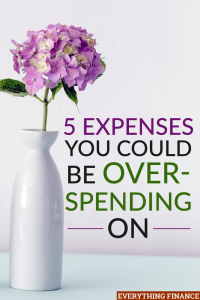 Have you ever caught yourself overspending on any of these expenses?